Epic Fu is Back Jan. 21st! Where the Hell We've Been and Why! Hello out there in Internetvision land! 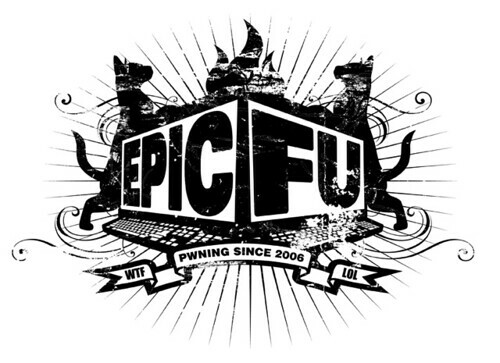 I'm really happy to be writing this blog post, because I get to let the world know that we're launching a new season of Epic Fu on January 21, 2010! To celebrate we're going to drink a lot, and you're invited. But before we drink, the great folks at Tubefilter will feature Zadi and me in an onstage discussion as part of their monthly Web Television Meetup to talk about the show and our experiences creating and iterating it over the years. Our deals with Next New Networks and Revision3, our almost-multi-year cable television deal, assembling a team, building a brand, dealing with the ups and downs of new media -- it's all up for grabs. For the January edition of the Hollywood Web Television Meetup, we are proud to present a very special evening with popular internet culture show EPIC FU as they launch the new EPIC FU network. Join us as we screen the premiere of one of the web’s most revered and award-winning series, followed by an intimate discussion with its creators, Zadi Diaz and Steve Woolf. The evening is sponsored by HP and Intel, who will be onhand to give away a free HP Envy laptop and a free HP DreamScreen for Meetup attendees. This is definitely a night not to be missed! epic fu plans -- need your feedback!!! NOTE: the main discussion around this blog post is taking place on Mix. Please go there to participate! Zadi and I spent a lot of time the past two weeks thinking about what the next iteration of Epic Fu needs to be and how we can do it. Then we had another conversation tonight and it all changed... for the better. It seems like the longer we make the Epic Fu web show, the more it becomes clear that there is a vast but disconnected sea of people who have a passion for the way global culture is influenced by what is happening on the web. We tend to be the ones who are a couple steps ahead of our friends and families, the ones that the people in our lives look to in order to find out what's coming next. what's up with EPIC FU? the 2009 edition! Hello there! Lots of you have been asking on Twitter and through email about the status of the show, so we wanted to get some info out there! First of all, check out our awesome 2009 Sizzle Reel embedded above! We've been spending a lot of time going to meetings and figuring out what the next move will be from a business standpoint for the show and for Smashface. From June 2008 to January 2009 we did 46 shows in 30 weeks, so we also needed a little break from the regular show schedule to keep our heads clear and to keep our energy level up around EPIC FU and the other projects that are in the works. filed: behind the scenes, community, epic fu related, have you heard? Hi guys, Annie here! I met up with Steve and Zadi for lunch the other day, and it really made me miss our fun summer together with the entire gang. So, I dug up some footage from our t-shirt promo shoot... yes, the t-shirt promo that just won't die. Enjoy! hello out there, and look at this editing timeline! Hey peoples. I'm so excited - this is my first post on the Epic Fu blog! I'm Mike, and I'm one of the lucky editors for the show. When I'm not working on FU-related-stuff, I'm usually locked up in my bedroom writing and editing "For Thousands of Miles." Which is a film about traveling... and other stuff... check the 20 second teaser from it above! More editing stuff after the jump! Here's a sneak peek at test footage I shot of Sarah for an upcoming EPIC FU promo. We don't do a lot of chroma key, so it was a fun change of pace. Keep in mind I only spent a few minutes keying out the background so it's pretty rough. Everyone here got a kick out of it, so I thought I'd post it for everyone else to enjoy! Also note this is shot in HD (you can download the original file). Hmm. I walked into the EPIC FU headquarters this morning and Mike Ambs was sitting at the editor's desk. Many people know Mike from Project Pedal, an incredible web documentary about a cross country bike trip and the relationships it effects. I first met him when he was preparing for the epic bike ride. Its fun that Steve and Zadi are hiring local podcasters to be a part of their team! You can follow him on Twitter and friend him on MIX. True story: Micro once stole a muffin from under our editor Daniel's nose. In case you didn't know, Micro is one of two resident cats at EPIC FU HQ. He's usually freakishly skittish EXCEPT when there is food in the vicinity. Rick decided to spin up a little "Guess the 80's movie and artist" game for us to play last week. Final scoreboard after the jump. Ask and ye shall receive! On one of my last behind-the-scenes videos, Kurt Snieckus asked "Can you do a behind the scenes where the computer systems are explained? I see two dells under Steve's desk and am itching to know what they are doing." Penguinator wondered the same thing: "I saw a lot of computers too under there. I wonder what they are for." Alright, some nitty gritty technical behind-the-scenes stuff! Here's a little bit about the lighting. We use a couple of Lowel Pro-lights with different colored gels on the show. Check the video for Steve's thoughts, and there is one more photo after the jump. For every episode of EPIC FU that goes up, a master text document is created with all the show descriptions, keywords, and most importantly, links. Since we distribute the show to several different websites, this file comes in handy when it comes to uploading the actual episode: the accompanying information can be quickly copied and pasted from the master text document. We do this because we feel that it's important to give people a place to find the videos and artists we feature on the show- giving credit where credit is due! Last week, we were doing a bit of brainstorming when everything kind of just came to a grinding halt. 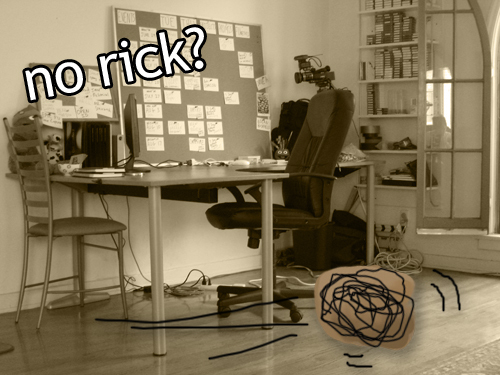 There's been an awful cold going around the office lately, and it's last victim is Rick. It was kind of quiet in the office without him today, so we played his beloved yacht rock at full blast. Ahh... much better. This is what springing a camera on unsuspecting FU-ers looks like. Steve used the extra time from our lock out fail to show off his gracefulness. For those who may not know Sasha, one of the resident cats at EPIC FU HQ, here's all you need to know. On Monday I picked up the new EPIC FU shirts. They look great, and we can't wait to get them processed and shipped today. However, sometimes we run into small roadblocks here at HQ. When I pulled up with the shirts at the office, Rick, Steve, and Zadi ran out to help me bring them up (we're located on the second floor). When I got to the bottom of the stairs, I heard Zadi say from top, "Oh... no," and the sound of a door knob jiggling. Your guide to what the web is buzzing about. EPIC FU blog content is licensed under a Creative Commons Attribution-Noncommercial-No Derivative Works 3.0 License.